Findlater and the Elgar Choir posing on the steps of St. Andrew’s-Wesley United Church (First Baptist Church tower in the background). The Choir consisted mainly of teenaged girls, but a few boys whose voices hadn’t yet changed were also members. n.d. BC Archives. Charles E. Findlater (1893-1975) founded and led the Elgar Junior Choir from 1924 until shortly before his death.¹ Until Findlater received permission from English composer Sir Edward Elgar’s daughter in 1932 (there is some disagreement as to the year; in some places, 1935 is cited) to use “Elgar” to identify the choir, it was known as the “Wesley Methodist Sunday School Choir” which later evolved to the “St. Andrew’s-Wesley United Church Junior Choir”.² According to the Canadian Encylopedia, the repertoire of the choir was drawn principally from Elgar and his British contemporaries. 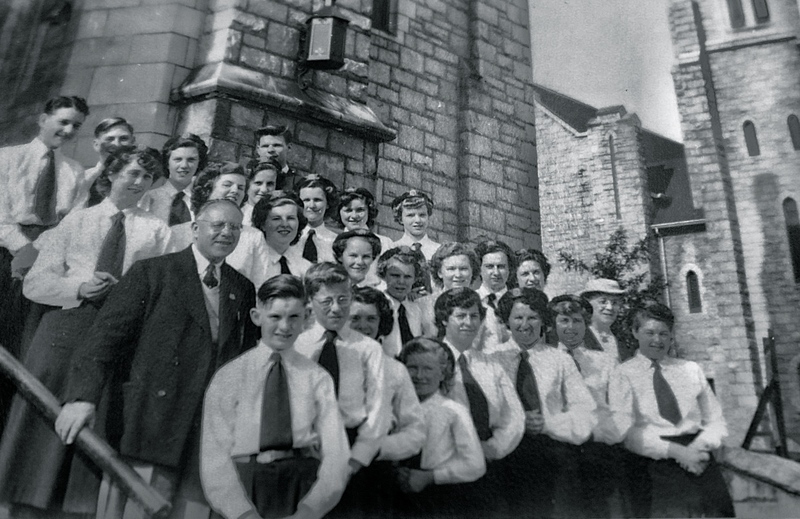 1936: Tour to U.K. and Norway (Highlights: World’s Sunday School Convention at Oslo; Bournemouth Musical Festival, and the National Welsh Eisteddfod at Fishguard, Wales) – later called the First British Tour. Early 1940s: Plans for a second British tour were cancelled due to wartime hostilities; instead, the Second Canadian Tour (1941) and the Third Canadian Tour (1942) were arranged. The object of both tours was principally to fundraise for war charities. 1974: Choir’s 50th Anniversary Reunion was held at St. Andrew’s-Wesley United Church. It was estimated at the time that over 6,000 choristers (boys and girls) had been Choir members during its lifetime. (A 14th overseas trip had been planned for summer of 1974, but that seems not to have happened, presumably due to Findlater’s worsening health.) I suspect that most of the photographs in this post that are courtesy of BC Archives were originally supplied from this reunion. Elgar Choir touring U.K. They appear to be posed in front of Canada House in London, England. n.d. BC Archives. Vancouver Sun. 4 Oct 1963, p.3. Photograph in honour of CEF’s “retirement”. A bit premature! Crop of a Brian Kent photo. (The article from which this was taken was generously provided by former Elgar Choir member, Nancy Nelson (nee Haines). School of Music”, which was established ca1935 and continued to thrive until his death. The school consisted of space in the Fairfield Building (no longer extant; at the NW corner of Granville and Pender). Findlater was Music Superintendent of Vancouver Schools from 1928-31. He taught piano, music theory, and directed the choirs at Crofton House School. Beginning in 1941, he was Director of the choir at Vancouver College (a Roman Catholic school established by the Christian Brothers; it was/is located at Cartier and 39th Ave.). He was choir director at Knox United Church and at St. Mary’s Anglican Church (both in Kerrisdale) at different periods. And he served as a music adjudicator at music festivals across Canada. Mrs. (Amy) Findlater, the choir director’s wife, was chaperone and ‘mother’ to the Choir. She accompanied her husband and the choir on every tour they made (she died in 1973, just two years before CEF’s passing). My recollection is that Mr. Findlater told us that the Choir had a special train car from an arrangement with either CPR or CNR (probably one of their older cars that had been taken out of regular service) which was renovated to the Findlaters’ specifications. The forward part of the car included a lavatory, a space that Mrs. F had fixed up as a kitchen (with a fridge and hot plate) and their sleeping quarters. We were not permitted to go into their end of the car. Mrs. F handled the money and she also had a list of staples – provided by our parents – so she could make sure we ate properly. We would pull down the upper bunks and arrange the lower bunks for our sleeping arrangements and then, somehow, put them out of the way during the day when we sat facing each other over tables for travel and eating. It was ingenious to have that ‘special’ car, with it only having to be shoved in a corner of the rail yards when we were on tour and stored between tours. There were no porters, conductors or other rail personnel on our car and no dining car was required of the train company. We were completely autonomous, except for being towed around. The special car was probably Mrs. F’s brain child. She was quite a lady, and a force to be reckoned with! We certainly didn’t travel First Class or even Business Class, by any stretch of the imagination. It was bare bones, going and coming. But for those young singers who worked so hard studying, then auditioning, and then spent months practicing to get to go on tour with the Elgar Choir, it didn’t matter a fig! Mrs. F was a law unto herself. She didn’t want any of the choristers to get sea sick. So, 2 or 3 days before our train car arrived at Montreal, she hauled out a huge metal container and stirred up what we called ‘the witch’s brew’. I can’t tell you what it was made of, but it was pink! It wasn’t just a laxative…it was a purgative! We lined up and each of us had to drink our dose in front of her! If you barfed it up, she made you drink another. It was bitterly terrible! There was one lavatory for the 18+ choristers and a pianist. We were running literally all night and most of the next day! Unfortunately, someone forgot to check the cupboard on the rail car before we left Vancouver to ensure we had sufficient toilet paper. So, we had to line up (again) to receive from Mrs. F our individual allotment of four squares of TP. The squares came with instructions, delivered by Mrs. F with a straight face, that we were to fold each square and use it carefully! Oh, my. It was a wild trip into Quebec! Mrs F’s witch’s brew sure paid off, though. While some passengers were stuck in their shipboard cabins during rough weather, we Elgar choristers were all practicing our hearts out! The Findlaters were hardened and savvy travellers. They knew that the best prevention for sea sickness is to clean out the gut! Music: Frank Weir. Music: Friedrich W. Moller. Lyrics: Antonia Ridge. 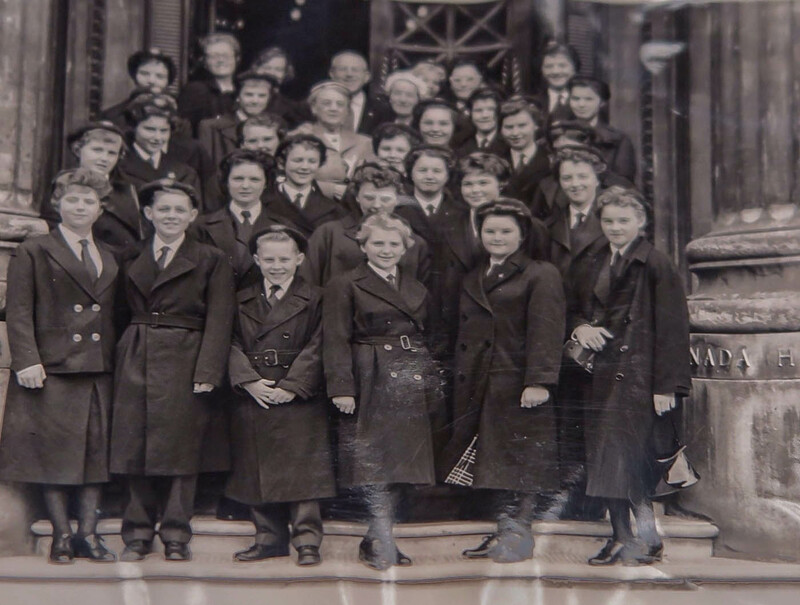 If anyone who reads this post is a former Elgar Choir member (especially one who was on the 1954 tour with Nancy Haines), would you consider commenting below? Nancy would love to be in contact with you. If you comment on this post, I’ll pass your comment along to Nancy. ¹In a 1970 ad, I noticed that the Elgar Choir had changed their name to the “Eldigar Singers (formerly the Elgar Choir)”. Coast News, June 10, 1970, p. 8. What prompted this apparently very brief name change isn’t clear to me. In any event, the use of the name seems never to recur. Note also that there were several other “Elgar” choirs based in other Canadian cities in the first few decades of the 20th century: in Winnipeg, Montreal, Brockville, Sudbury, and perhaps elsewhere. None of these seems to have been anywhere near as long-lasting nor as renowned as the Vancouver choir, however. ²Wesley Methodist in the 1930s merged with St Andrew’s Presbyterian to become St. Andrew’s-Wesley United Church. They also moved to a different church structure. When it was a Methodist only congregation they made their home at Burrard and Robson. When it became St. Andrew’s-Wesley, they moved to Burrard and Nelson. This entry was posted in music, railways and tagged Amy Findlater, bc, Charles E. Findlater, Crofton House School, Eldigar Singers, elgar junior choir, Elgar School of Music, Fairfield Building, history, Nancy (Haines) Nelson, Sir Edward Elgar, St. Andrew's-Wesley United, The Happy Wanderer, vancouver, Vancouver College, Wesley Methodist. Bookmark the permalink. I remember the 1954 tour Nancy. You were our soloist. “Every Valley Shall Be Exalted”….”Three Mummers”…. your trio fellow alumni Gay and many others. She & I were 3rds. I do remember the very large can of strawberry jam brought from home for the cross Canada journey to board ship for trans Atlantic journey. I remember so fondly my time with the Elgar Choir and the wonderful experience of travel at the age of 16! Reading this has brought back so many memories of our trip in 1954! The one memory I will never forget is watching g a 3D movie in Montreal!!! Also the trip across the ocean on the Saxionia and Corinthia, coming home at the end of the tour in that hurricane! I had the privilege of looking after the 3 youngest choristerswhich was always fun! My greatest joy is my friendship, still today with the chorister I was billeted with in Dublin! I have had the privilege of visiting with Mary and her family 3 times over the years! I am forever indebted to my parents for enabling me to be part of this great choir and to Mr and Mrs Findlater for allowing us to be ambassadors for Canada!